The Night Scorps animation sequences! 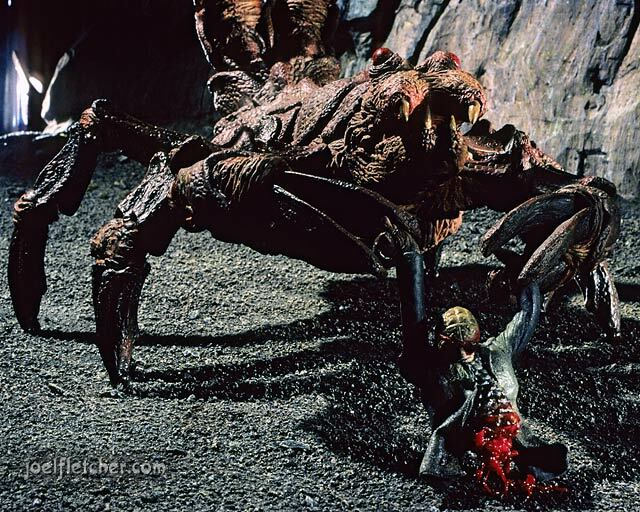 In 1994, animation legend David Allen (1944-1999) hired me to animate gigantic scorpions for the feature film Oblivion. The film was a bizarre space-western, the original "cowboys and aliens"! It was produced by Full Moon Entertainment, which was a very busy studio with many movies in production. At that time, David was running the Full Moon special effects department and rarely doing any actual hands-on animation. In fact his main concern was planning for his upcoming Primevals movie, which was his dream project. He trusted his crew to create the work for other films such as Oblivion, under his overall supervision. I teamed up with Joseph Grossberg, who was in charge of the visual effects camera work and lighting. 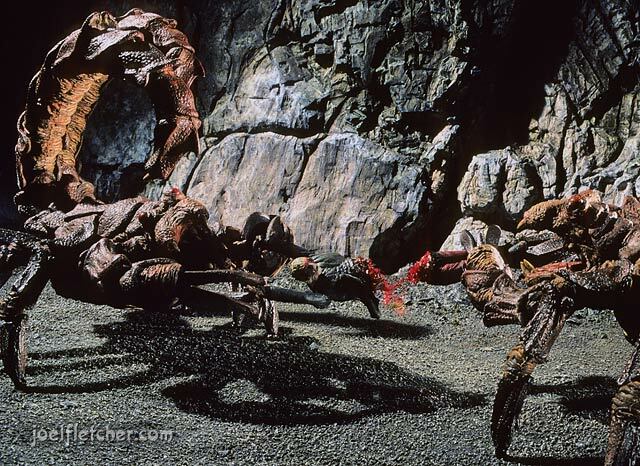 My task was to bring the giant alien scorpions, called Night Scorps, to life via stop-motion animation. I am using surface gauges to measure the movement. Note the counterweight above. We used 3 types of setups: The rear-projected frame-by-frame process shot (AKA dynamation) was used for many of them. 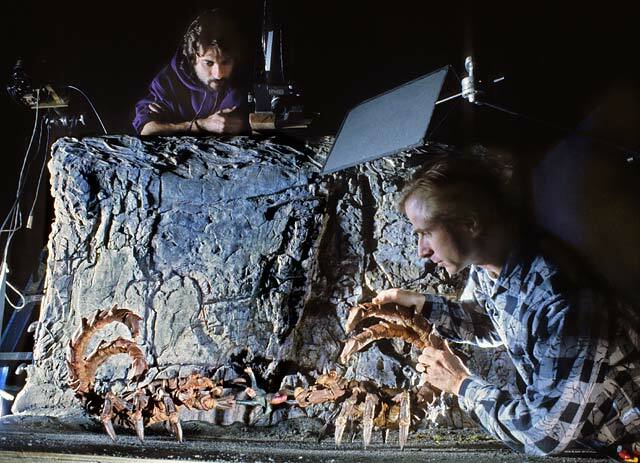 For static backgrounds, a backlit "translite" was used with miniature ground in front for the scorpion puppets to walk on. And a full miniature set with a cliff wall was used for the final sequence. The Night Scorp puppets were made by the late Laine Liska, with ball and socket armatures by Jeff Taylor. The puppets were beautiful and moved smoothly. Unfortunately they were quite heavy, and if more than two legs were off the ground they would tend to sag! I solved that by attaching a wire to the scorpion's body which had a counterweight on the other end above the stage, to reverse the force of gravity. That solution worked great, but I had to be careful that the wire would not show when photographed. Two giant Night Scorps tear apart the alien villain Redeye. 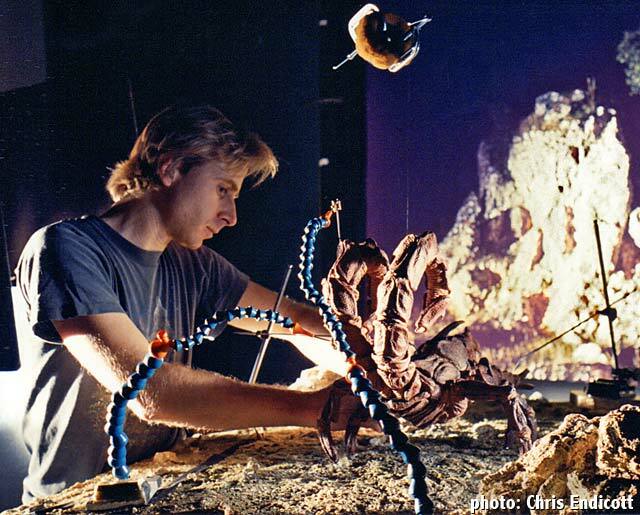 Joseph Grossberg and Joel Fletcher on the Oblivion stop-motion set. About 95% of the final animation was mine, but there were a couple shots that were too complex for one animator. In those shots two Night Scorps are fighting over the villain Redeye, which they have in their claws and tug on him until he rips in half. Fortunately Paul Jessel was available to help me out, as extra hands were needed to coordinate the back and forth pulling between the two Nightscorps. It took a lot of careful planning to rip apart the Redeye puppet frame-by frame, ultimately adding blood and guts at the end. Like a couple of kids, Paul and I had a lot of fun animating those shots together! Sadly, the shot where Redeye is pulled apart was cut short in the final film. The blood and guts part was considered too gruesome and was edited out. Naturally I was disappointed as that was the most difficult shot to animate and was very effective. The alien Redeye torn in half by the Night Scorps. Being a science fiction western, clearly Oblivion was a very weird film. It currently has a cult following due to it's campy style, and well known actors such as Julie Newmar, George Takei, Isaac Hayes, and Meg Foster. I particularly liked Musetta Vander as Lash, Carel Struycken as Gaunt, and Andrew Divoff as Redeye. Even so, it is a "B" movie and the Night Scorps animation sequences are arguably the best thing about the film. For those interested in seeing it, Oblivion was recently re-released by Full Moon Entertainment.